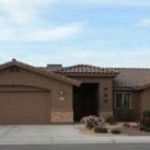 Beautifully crafted 3 bed/2 bath TDG home w/ pool & hot tub. 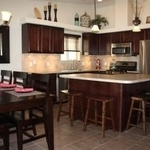 Located in the newest phase of the Estrella development in Mesa Del Sol in the Foothills; available June 15th, 2012. Master suite includes garden tub, spacious walk in shower, double sinks w/ raised countertop, oversized walk in closet, sliding glass door with access to the backyard oasis, & extra room for a sitting area, treadmill, or office. 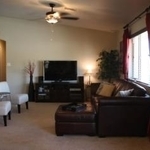 Cool off on hot summer days in the pool or on the covered patio equipped with ceiling fan. 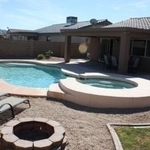 Those cool winter nights can be warmed in the hot tub or by the fire pit. 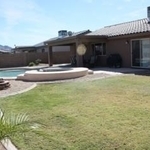 Upgrades include fully landscaped front & backyard, tile throughout hallways/kitchen, security system, stainless steel appliances, under-mount cabinet lighting, custom backsplash, salt system & automatic pool cleaner, additional cool deck, double wide gate ideal for RV/boat storage, & automatic timer for lights. Attached 2-car garage is complete w/ built-in workbench and vast storage cabinets. 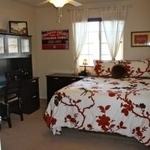 Additional amenities include ceiling fans throughout, linen closet, full pantry, and laundry room w/ cabinets. Rent includes yard & pool service.